Pastor Uncle Ossie Cruse with Steve Miller M&G NSW. Photography Mimi Kelly. On Friday night Museums & Galleries of NSW recognised the achievements and contributions of Pastor Uncle Ossie Cruse AM MBE. 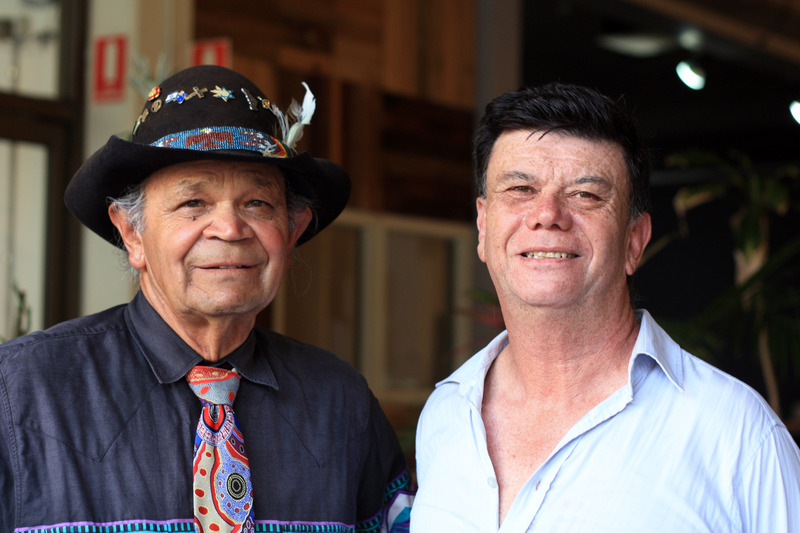 Pastor Uncle Ossie Cruse has devoted his life to the Aboriginal people of South East NSW. Since the establishment of the Bega Valley Aboriginal Advancement Association in 1968, Uncle Ossie has been actively involved with Aboriginal affairs, at a local, state, national and international level through the World Council of Indigenous Peoples. Through Uncle Ossie’s vision and drive, the Eden Local Aboriginal Land Council established the Monaroo Bobberrer Gudu Cultural Heritage Keeping Place in 1994. Built brick by brick by the local Aboriginal community, it includes a purpose built cultural centre with Indigenous interpretation and displays, meeting facilities, a commercial kitchen, large performance hall, outdoor amphitheatre and a cultural walk. The Cultural Centre is the gateway to the Bundian Way, the first Aboriginal pathway to be listed on the NSW State Heritage Register. The Bundian Way, a project of the Eden Local Aboriginal Land Council, is a shared history pathway between Targangal (Kosciuszko) and Bilgalera (Fisheries Beach) that connects the highest part of the Australian continent and the coast. The first dedicated camp site on the new Bundian Way was opened in 2013 and further work is expected to be completed by the community in time for the arrival of cruise ships into Eden in 2015. We were fortunate enough to have Uncle Ossie with us at the IMAGinE celebrations. You can read more about Pastor Uncle Ossie Cruse on the ABC South East NSW website.